Old buildings get new life when converted to new purposes. In the process, we salvage a neighborhood’s story and honor its fabric. Formerly a 2-family residence, 1075 Washington Street now houses 12 small businesses. It’s a win-win for the community when fine old buildings like this are saved from the wrecking-ball and people living nearby can walk to work. The 1991 Americans with Disabilities Act profoundly changed our practice. City and state agencies, commercial building owners and public institutions hired us to evaluate their older properties and design access upgrades. We renovated entrance and service area upgrades, new ramps and lifts, rest-rooms, parking and site improvements. In this restaurant project, dual ramps link indoor function rooms with an outdoor dining courtyard. We like old buildings. They have a character and quality of workmanship that’s unusual today. More significantly, they allow us to see how materials fail over time, and to design better buildings. Many of our restorations focus on the building envelope – roofing systems, exterior walls and foundations, doors and windows. We trace the source of damage, then develop repair plans that mesh historic with modern techniques, such as this courthouse roof restoration. Offices, retail shops, and restaurants can be high turnover tenants, triggering frequent renovations. When a building owner is also its tenant, interior remodeling projects can grow to include systems upgrades such as structural, access/egress, utilities, and building envelope. For this bank we cut new openings in central atrium walls to link private offices with public space, thereby enlivening classic teller stations rendered obsolete by ATMs. Passive solar design makes a lot of sense in New England. Large south-facing windows invite winter sunlight, while deep roof overhangs bring summer shade. North walls receive less glass and more insulation. By strategically placing shade trees, and choosing materials to absorb solar energy, we can control indoor environments and energy costs. Active solar design, such as upgrades to this house, adds solar panels and collectors. Occasionally a vacant lot comes on the market near Boston and we have a chance to design a new house from scratch. Projects like this can involve extensive public approvals if the lot is constrained by unusual topography or geography. We welcome the opportunities that new construction presents to orient the house properly and take advantage of natural features, while working with the homeowner to create a home that is uniquely theirs. Population shifts and the proliferation of shopping malls ha s left many older cities and town centers vacant and crumbling. In collaboration with business groups and individuals, and with the resources of federal grants paired with private investment, we restored over 350 older buildin gs, parking areas, and street scapes, to create more user-friendly and business-savvy town centers. A feasibility study puts renovations on a solid base by isolating master-planning from design tasks to avoid conflicts of interest. Studies are required for public buildings, and recommended whenever the work-scope is complex or may exceed funds. Studies identify the myriad problems with older facilities – code non-compliance, systems failure, outmoded functionality – and set priorities for improvement. Shown is Shattuck Hospital in Jamaica Plain MA. Architecture has the power to change how we live – bringing families together, making life easier and people happier. For three decades award-winning architect Deborah Pierce has been designing homes tailored to those who live and visit there. 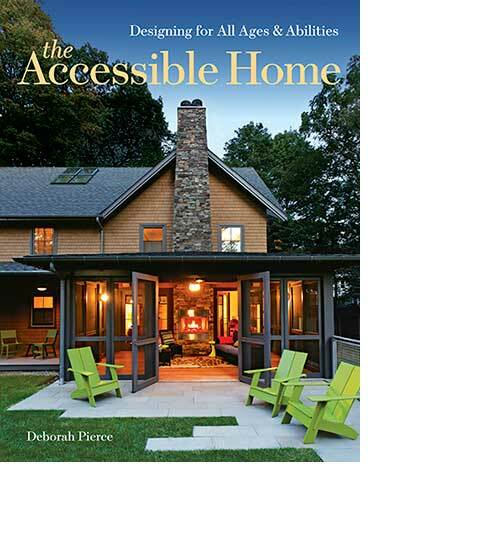 Her book, The Accessible Home: Designing for All Ages and Abilities, celebrates the special alchemy that occurs when curious homeowners collaborate with thoughtful designers to create homes that are beautiful, functional and full of possibility.